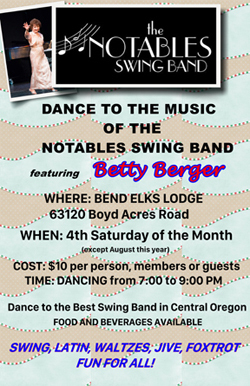 The big band era comes alive whenever The Notables Swing Band plays the great swing music of the 1930's - 50's. 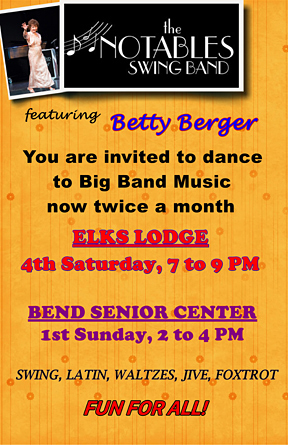 We are a 17-member band in Central Oregon that provides rousing live big band music for dancing and entertainment. Our playlist also includes a big variety of more recent favorites, all played with the traditional full sounds of a classic big band. Welcome to our website! We invite you to contact us if you have any questions or are thinking about booking a gig for your next event. Join us and dance, dance, dance! join the crowd and meet new friends. 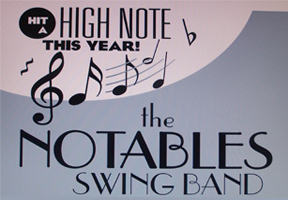 Please consider The Notables Swing Band for your next event. Join our e-mail list to receive notifications of performance dates and other timely news. Let us know the desired date, location and type of event. Or send a question you might have. Thank you for your interest in our band. We'll get back to you soon. Thank you for your interest. We'll add you to our mail list for upcoming gig dates. Sorry, the code you entered is not correct.